As a small charity without limitations to the personal liability, and which is hoping to rent premises for the first time. Do we become a company limited by guarantee or a charitable incorporated organisation and why? This was the question posed to us over Facebook by Dudley CIL (Centre for Inclusive Living) on Tuesday evening (on Small Charity Week’s Big Advice Day). I thought it might be worth providing some information here in case it’s useful for others in a similar position. 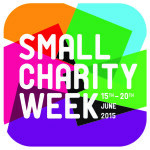 It’s Day 5 of Small Charity Week 2015, and today is all about fundraising. I’ve offered to write about crowdfunding. There are no shortage of articles, blogs and even whole books about crowdfunding out there. Becky has shared some useful links on the last slide in this presentation. I’m not going to repeat what is already out there. I thought it might be useful to share what I learned from actually being involved in a crowdfunding campaign. A bit of background follows, feel free to skip to the learning points if you wish, and let me know what you think. Back in autumn 2013 I went along to some informal pizza suppers and conversations in coffee shops in Birmingham which were open to anyone and shared widely on social media. The sessions were convened with a view to finding people who would contribute ideas and work together to build a community of innovators, creatives and entrepreneurs and create a home for them in Birmingham. A group of around 15 people emerged as being committed to taking things forward, and we met over a period of months to develop our thinking. 12 months later we were ready to start planning a crowdfunding campaign to help our vision turn in to reality. By this time a few more people had joined the team, crucially some amazing film makers, a designer and one of Birmingham’s best photographers. 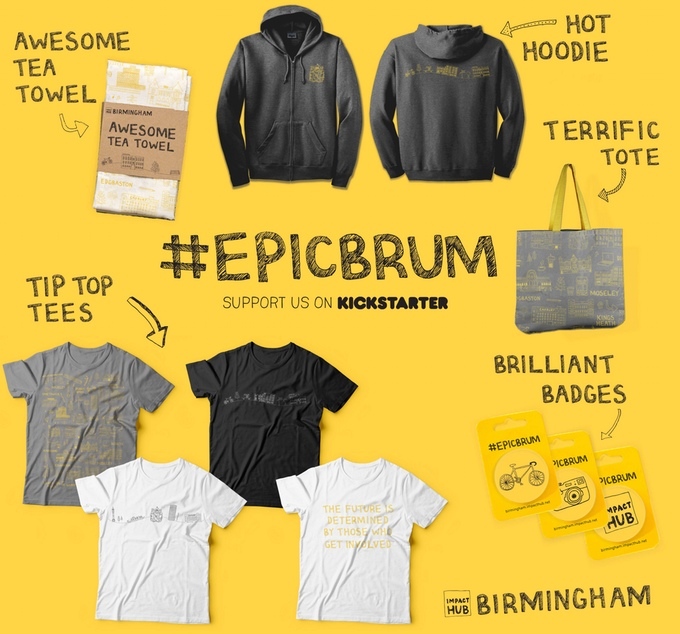 We aimed to raise £50,000 from our networks, by far the highest target to date for a Kickstarter project in Birmingham. We got together for a 48 hour crowdfunding design lab to look at other crowdfunding campaigns, figure out what we wanted ours to feel like, make key decisions, create video storyboards, generate design content and shape our rewards structure to get us to our target. We launched on 4 December 2014. The first two weeks were amazing, then we plateaued at the £25,000 mark (50% of our target) for over a week, way past Christmas, with only 8 days left to our deadline. Something important to consider in crowdfunding is that platforms like Kickstarter are all or nothing. If you don’t hit your target no money is taken from the people who pledged support from you. We re-grouped just after New Year’s Day and put in a final, monumental effort, reaching out as far as we could in our networks, following up any likely leads, and still remembering to have fun together. 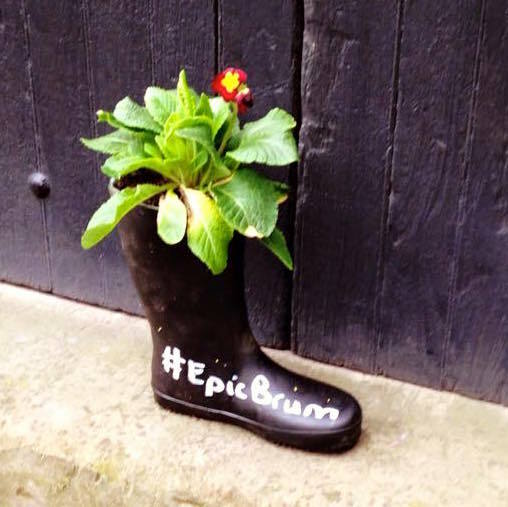 (Fun included some guerrilla gardening style placing of plants around Digbeth, where we wanted to make our home.) Thanks to the relentless positivity and effort of the whole team we hit our £50,000 target a matter of days later, leaving us 2 days to try and hit a stretch target of £65,000. Which we did, with minutes to spare! We had successfully engaged a community of 586 backers, all of whom have an interest in everything we’ve been doing since, many of whom are now signed up members of our Impact Hub community and amazing space. I learned a huge amount being part of this Kickstarter campaign, and below I’ve attempted to draw out 5 of the most important things I learned. It took years of investment in relationships, countless conversations and coffees and 3 mind-blowing TEDx events in Birmingham to create a network and team strong enough to do something this audacious. If I was looking to raising just £5,000 through crowdfunding I would spend at least a year building genuine face to face and online relationships. That means saying ‘yes’ to all sorts of conversations and invitations, and thinking hard about how well your existing relationships are being maintained. 2. Being ridiculously optimistic definitely helps! A strong, well networked and ridiculously optimistic team was crucial. Our team used a WhatsApp group to constantly encourage, celebrate, scream with excitement, be silly and talk tactics. Without that willingness to communicate at all hours of day and night and be hugely supportive of each other I don’t think we’d have achieved what we did. A really diverse range of skills and experience was our secret sauce. A huge amount of credit is due to Immy Kaur, who convened this diverse team, spotted gaps and knew who to lure in at the right times! You have to step up. When things are this big and bonkers you can’t wait for someone to ask, or give you instruction. You have to know your strengths and talents and use them. For example Verity developed a wonderful photography project which got picked up by the Birmingham Post. I think it is really worth reading Amanda Palmer’s book The Art of Asking. You can get a flavour of what she has achieved in her TED Talk, however the book will give you much more of a sense of what it means to fall in to your crowd and ask them to catch you. In order to ‘crowd fund’ you need to make sure you have a crowd, and they are ready to catch you. Which takes me back to learning point 1 above. I hope you’ve enjoyed this, let me know if anything surprised you, resonated for you or just doesn’t feel relevant to you. If you are embarking on crowd building and crowd funding I wish you the very best of luck! 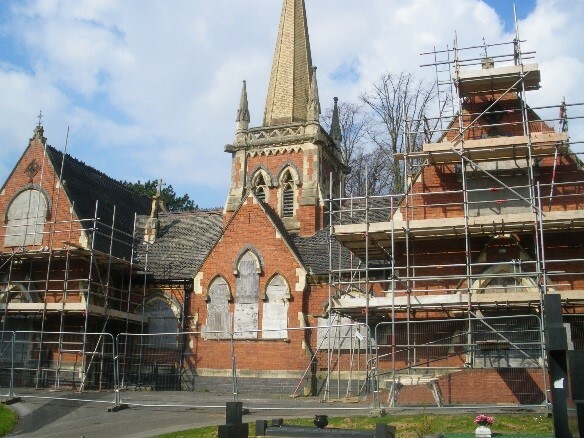 Ten years ago my work in Dudley was focused on ways that community groups, faith groups and voluntary organisations could influence decision making about local services in the borough. There were all sorts of partnerships of leaders, policy makers and managers creating strategies and plans in relation to regeneration, learning, health, community safety, housing, the environment, heritage and more. It was very difficult to know if our sector was exercising any influence on decisions and plans being made, and what impact we were having. We had lots and lots of conversations with people involved in networks in Dudley borough comprising community groups, small charities and faith groups, as well as larger charities. We discovered a number of ways that they influence. Can you see advantages and disadvantages depending on your overall goal? What works for your group or organisation? 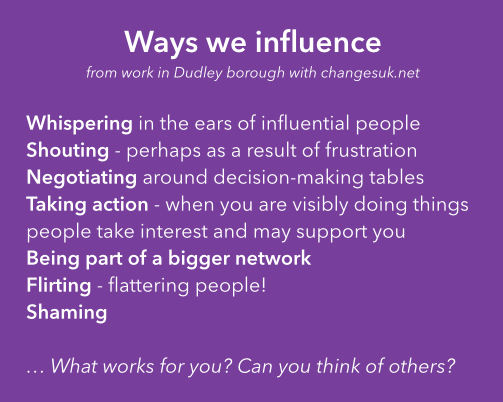 By working with people from a range local groups and organisations in Dudley borough, we also figured out a useful way for people to what their capacity to influence is, and what steps they can take to increase it. These steps form a crucial part of the Voice framework. Do these steps reflect things you have thought about? Do any of them give you ideas about new things you could try? There is much more to the Voice framework, and there are a number of people who work and volunteer in Dudley borough who have been trained to work with groups using Voice. I use thinking and activities from Voice in my work all the time because it is so useful. 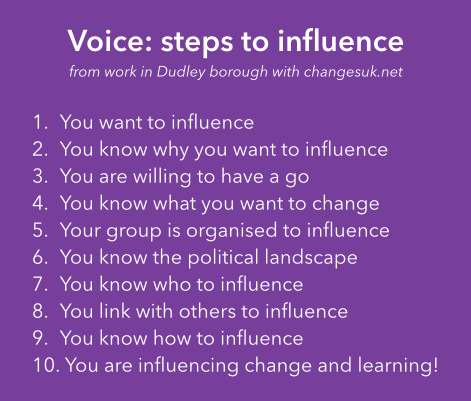 If you would like Dudley CVS to run sessions on influence using Voice please do get in touch. You can read more about Voice in this Handy Guide. There was a lovely short article about influence and Voice published in NCVO’s magazine. For anyone with a taste for something more academic, there was an essay on Voice published in the Community Development Journal in 2008. As you have no doubt spotted by now, we are celebrating Small Charity Week in Dudley borough and we have plans for all sorts of support and discussion opportunities both face to face and online. I’ve offered to collect and share ideas, stories and top tips for Policy and Influence day (Wednesday 17 June). In our most recent survey of our sector the third most important area of support organisations and groups said they want Dudley CVS to provide is creating the conditions for the sector to influence local policy and planning, be engaged, represented and involved in local decision making bodies. Also making it on to the top 10 priorities was support to the sector to campaign for social change. As the Small Charity Week website points out: small charities are the centre of civil society. In the UK 97% of charities have an annual turnover of less than £1.5 million but in terms of impact on local communities here and across the globe their contribution is phenomenal. 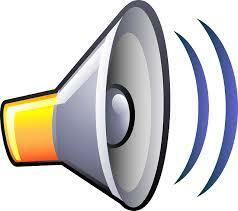 It is important therefore that the voices of small charities are heard. success stories – what or who have you influenced and how? learning – what worked and what didn’t in your efforts to influence? Just leave us a comment below or reply on Facebook or Twitter. And in the meantime, here is a brief but very useful piece of advice about influencing decision-makers on the Campaign Central site. Let us know what you think of it. Eileen (@dudleyvols) has shared a nice, visual six simple steps to involving volunteers in advance of Small Charity Week when we’ll be holding a drop in to answer all of your volunteer-involving questions on Thursday 18th June, 1pm-5pm. Why not drop into our office between those times or, if you can’t make it, ask your questions here, on the Volunteer Centre blog, Twitter or Facebook and we’ll do our best to answer them for you. As Eileen said, she can help you every step of the way and all year round to help your volunteers have the best possible experience with you. Commissioned by the local Police and Crime Commissioning Board, 9 organisations within Dudley borough, through 1-2-1 interviews and focus groups, recently undertook a survey with 417 Dudley residents who had been victims of crime. The aim of the research was to seek and represent the views and experiences of victims of crime as of February 2015.